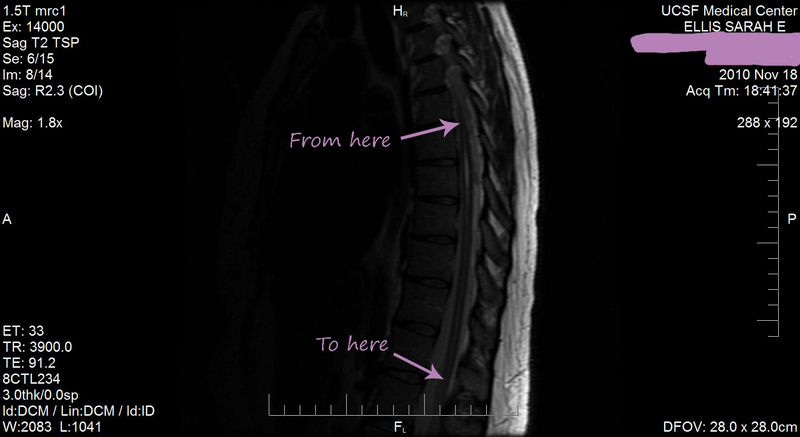 Instead of laying out the very long story as to how I came to be diagnosed with 3 neurological diseases, I figured I would just show you some cool pictures of my brain and spinal cord and give you a brief timeline of my journey to one, two, three neurological disease. Yay! *Also note that my previous last name was Ellis, so yes, those are my scans. You see that blob in my frontal lobe area? That’s not supposed to be there. I have at least three of those. Same blob, different angle. 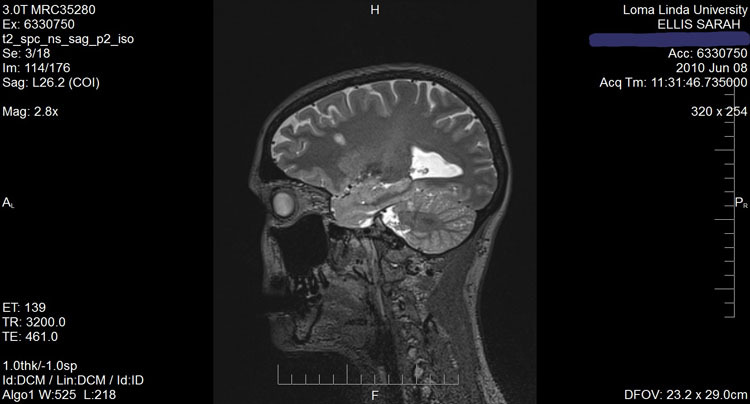 The others aren’t visible in these images because they’re located in a different area of my brain so they’re on a different “slice” of the MRI film. 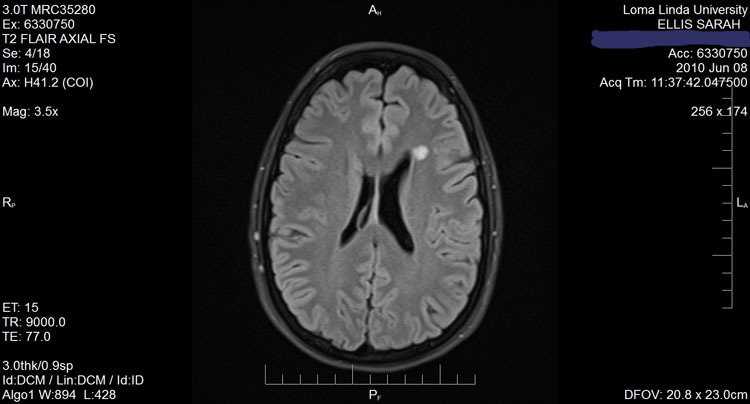 My Syrinx above, which at one point was said to be a Neuromyelitis Optica (aka Devic’s Disease) lesion. And here, I tried to show how long it really is. Most of these films are old and I am definitely due for some new scans. Coming soon. Hopefully I haven’t progressed. Fingers crossed for me. Here’s the timeline to the best of my memory. June of 2009 – Diagnoses with Migraines. October 29, 2009 – Diagnosed with Relapsing Remitting Multiple Sclerosis or RRMS. November 11, 2009 – Started injecting myself daily with a disease modifying drug called Copaxone. My first injection is pictured below. Isn’t it lovely? June 22, 2010 – Found out I was misdiagnosed and instead of having RRMS, I have Neuromyelitis Optica, aka Devic’s Disease. June 27, 2010 – Stopped my daily injections (I never missed one just so you know. Even when my autoject started acting screwy and I had to do it manually. Eekkk!) The disease modifying drugs used to “slow the progression” of MS, do diddley for NMO, thus the reason I stopped. November 17, 2010 – Met with an NMO specialist who at first glance thought that I did not have NMO. Good News! But told me that I do have a syrinx, a fluid-filled cyst within my spinal cord, plus something else but he was unsure if it was MS and wanted to run some tests. November 17-18, 2010 – I went through 7 different tests during this visit and had to wait until January 4, 2011 for the results. 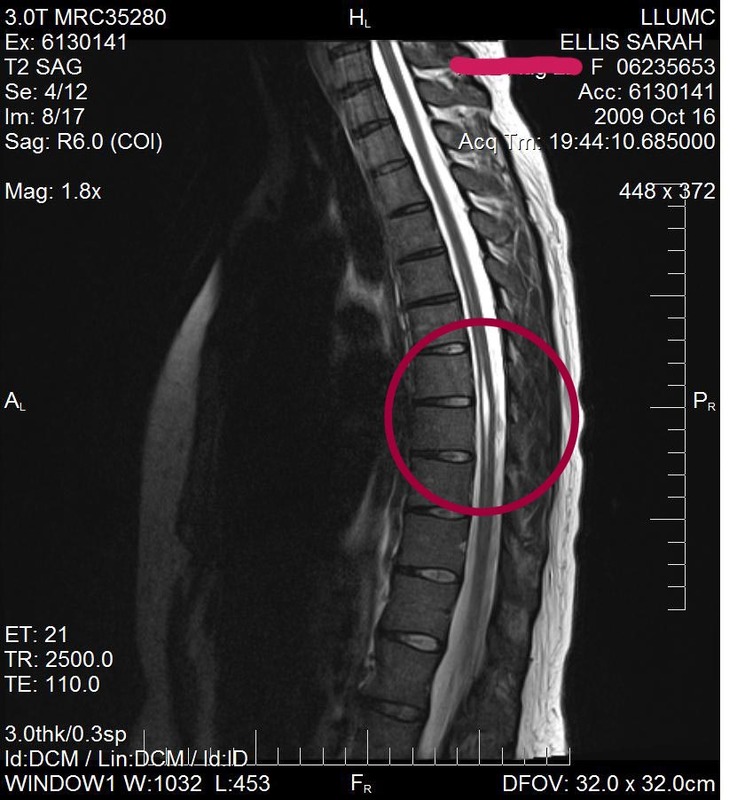 January 4, 2011 – The diagnosis was Migraines (which we already knew but he just wanted to confirm the previous diagnosis), Syringomyelia (which is the fancy medical name for a syrinx within the spinal cord) and Multiple Sclerosis. Damn! After all of the above, I reported the findings to my my MS neurologist who thought it was NMO instead of MS. He immediately disagreed with the “NMO Specialist” and said he still thought it was NMO and not MS. I pretty much said, “Screw all of you!” and just went on with life, on zero medication. Soon after all of the above I moved back to Houston for a year to be closer to family while my now ex-husband was deployed. While in Houston I saw another excellent neurologist and he confirmed the three diagnoses, Multiple Sclerosis, Syringomyelia and Migraines. Today, I fight it with a positive attitude, as much laughter and as little stress as possible, and good nutrition and exercise. I am on ZERO medication and intend of keeping it that way. I fight daily for my life and for my freedom and I hope to help others fight too.